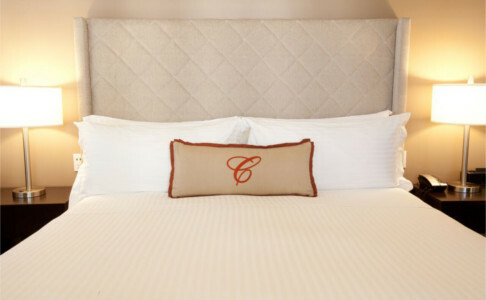 These totally charming guestrooms feature one queen bed with modern conveniences such as satellite television with premium channels, high-speed wireless Internet access, and well-lit work desk. In true European style, guests share a hallway bathroom. The sinks are in the room and the bathrooms and showers are independent in the hallways. The maximum occupancy in the shared bath style rooms is (2) adults. These rooms do not accommodate rollaway beds. Rates displayed are average rate per room per night. Discover one king bed in this classic guestroom that features modern conveniences such as Direct TV with premium channels, bedside USB ports, high-speed wireless Internet access, and well-lit work desk. The Standard Room comes with a private bathroom. Includes hot breakfast at Bistro Maxine. The maximum occupancy in the deluxe room is (2) adults.